Welcome to the long-awaited 2nd issue of Word-Buff Stuff! If you're familiar with this newsletter, feel free to skip my preamble and jump straight to the latest action. If this is the first time you've received this newsletter, or if it's been a while and you'd like some reminding, Word-Buff Stuff! is a free ezine from Word-Buff.com, a site dedicated to lovers of words and word games. The aim of this newsletter is to provide word game addicts like you with a regular injection of puzzles, tips, and chit-chat from the world of words and word games. Sorry! Only subscribers get the password. A challenging wordsearch puzzle, with a different theme each issue, that will put your vocabulary and spelling skills to the test. Yes, even if you're a grown-up! NOTE - If you can't see the puzzle pictures further down in this newsletter, or if you see weird characters all over the place, it may be that your email is set up to only read plain text. If that's you, just pop over to the Members-Only Area of Word-Buff, where you can view the newsletter as a webpage. TIP - If you solve this puzzle online, you can time yourself using an automatic timer I've set up (just below the crossword clues). Just for fun, I got a crossword solving champion to time himself solving this issue's puzzle. You'll see his time in the online puzzle. Be scared... be very scared. 11. "Who's ___ sleeping in my bed?" 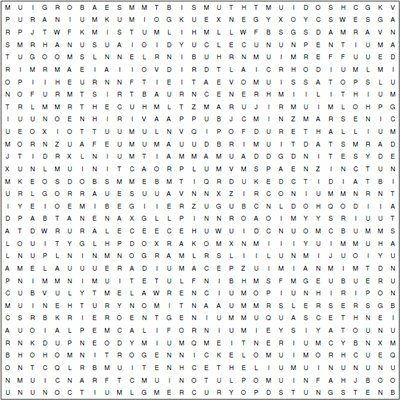 Below is a wordsearch grid in which I've hidden the names of 119 chemical elements. 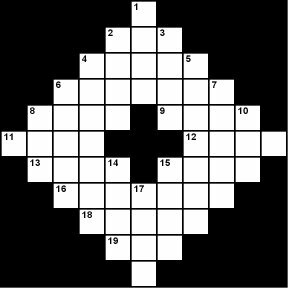 To solve the puzzle, click the grid and a printable version of the wordsearch puzzle will open, replete with the grid and a (rather long!) list of all the chemical elements you need to find. TIP - If you want to really test your knowledge of the chemical elements, try solving the puzzle without looking at the list of elements I've provided. When I first encountered this word, I thought it referred to the act of doing something a third time, as in redo, re-redo, re-re-redo... . The good news for the English language, though, is that it means no such thing! In fact, according to my sources, it can also be spelled reredorse or reredosse (although only the latter will help some of my Scrabble readers!). 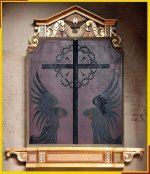 Reredos is usually pronounced rear-doss, or sometimes rare-doss, and refers to a piece of artwork, usually an ornamental screen, covering the wall behind an altar or communion table in a church. A TRIPTYCH - pronounced to rhyme with cryptic - is a piece of artwork, usually an altar-piece, divided into three panels joined with vertical hinges so it can be opened out or closed, just like the one in the picture. Sometimes there are only two panels, in which case it is called ... wait for it ... a DIPTYCH. You see, a visitor sent in a question to my Scrabble Q&A page asking why he was not allowed to play ERODERS* in Scrabble, even though he could construct a perfectly legitimate sentence containing this word. 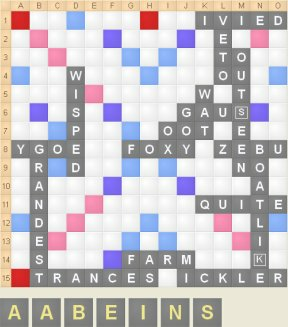 I won't bore you here with my long answer to that question, but I mentioned in passing that one way to utilize non-words in Scrabble is to link them to valid anagrams. Why? Because... as I mentioned in the last newsletter, I've been building a kind of 'site-blog'. A site-blog is a lot like a personal blog, except it's there to give you updates about a website rather than a person. If you want to be notified of the latest news on this website, all you have to do is subscribe to the Word-Buff Blog, just like you would to any old blog (don't worry - I explain how to do this on my blog page), and you'll receive updates as they happen. button in the top left of every page. That will take you to the Blog page, with all the latest news outlined in chronological order. You might vaguely recall that in the last issue of Word-Buff Stuff! I said I had some pretty cool interviews in the pipeline. Actually, there are more than just a few going on in the background right now, but one of them is ready for your viewing. It's an interview I've been wanting to do for months with America's fastest crossword solver. In fact, he's probably the fastest crossword solver in the English-speaking world! Curious? Well, pop on over to Word-Buff and check out my Interview with Tyler Hinman. Ok folks, I think I'm just about done for now. As always, I really hope you've enjoyed this issue of Word-Buff Stuff!, and that you'll take the time to help me make future issues even better by leaving some feedback in the Members-Only Area.